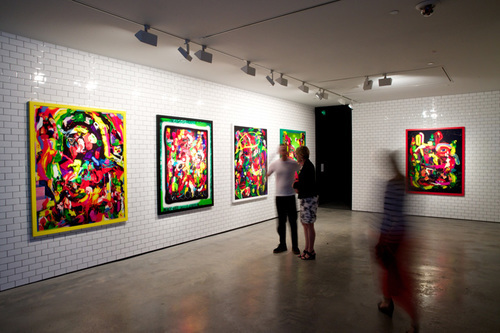 We work with a range of award winning and highly renowned Australian institutions and artists. When seeking out framing for an exhibition a number of years ago GAM came highly recommended by fellow artists for their professionalism and exceptionally high quality framing. Tugi, Simon and Dianna are wonderful to work with and I cannot recommend them highly enough. The very delicate nature of my works on paper had always been a concern when it came to framing, and their handling of works is second to none. I know that I can trust them entirely with all aspects of the process. On top of all of this the artisanship of their framing is stunning. The finish is always beautiful and complimentary to the artworks. Dianna always takes the time to advise me on many options, taking into account both budgetary and aesthetic concerns. I have always been able to depend on their professionalism, their attention to detail, their reliability and of course the stunning framing. I have been using Graphic Art Mount for framing and mounting my photographic artwork since 2003. Alongside their crew of experienced and hardworking framers, Diana and Tugi Balog are an incredible team. Their consistent high quality framing and mounting means I have never ever had to worry about my prints. Their expertise, eye for perfection and innovative ideas are accompanied by personal and warm customer service. This means that I would never go anywhere else. Image courtesy of the artist and Stills Gallery. I chose to work with GAM because they are far and away the best framing service in Sydney. They are the most reliable, knowledgeable and the most professional of anyone around, and they work to the highest standards. Graphic Art Mount have provided me with professional image handling services since 1998. What first impressed me about them is that they are leaders in archival photographic processes. They are always available to answer questions and are incredibly friendly, courteous and generous with their time. Importantly for artists they allow you to work closely with them on the mounting and framing outcome and can always can be relied on to meet exhibition deadlines. Tugi & Diana quite frankly are one in a zillion!!! I have collaborated with them for years on frame concepts and ideas and in every way Graphic Art Mount exceeds expectation. At every turn Tugi and his team delivers well beyond what I think possible & continues to show me old and new methodologies to always strive for perfection. Tug & Diana have been an integral part of my work for the last 5 years and I continue to seek their council and compare notes whenever I can, as their knowledge in the framing game is an important and vital archive in this day and age. Tugs custom frames he fabricates for me are impeccable. His attention to detail, his genuine care for the work and its longevity is such a rare gift. The work I get done at GAM is unpatrolled. Dianna and Tugi are the perfect storm when it comes to any framing wizardry. Large or small professional or domestic, it all receives the same care.